TQ Quest, blitzbro1, ziggyhtx and 2 others like this. They won’t release. They wont pay royalites. Can’t believe they are keeping up this “inspired by” series. Nujabez, TQ Quest, blitzbro1 and 5 others like this. Love em, the cartridge is a nice touch, very very cool and an emblem of my childhood. Too bad they're PE's. Hold on Jordan Brand isn’t some rouge brand or mom and pop operation that just steals copyrighted material and sells it recklessly. Brands under the Nike umbrella always think collabs out and seek the proper permission of their plan is to sell to consumers. Now you may be right- these may never get a broad release but Nintendo linking with Jordan Brand for a one-off is totally within the realm of possibility. nikekid6 and g-time like this. Jordan brand have done collabs with Microsoft/X-Box in the past their levels to this sneaker knowlegde people. But public will never get these so lets not plays games with ourselves. It’s been a poor generation for custom console designs, but I am very in for this official Xbox x Jordan collaboration. Only catch is that they’re for a competition, not a general release. 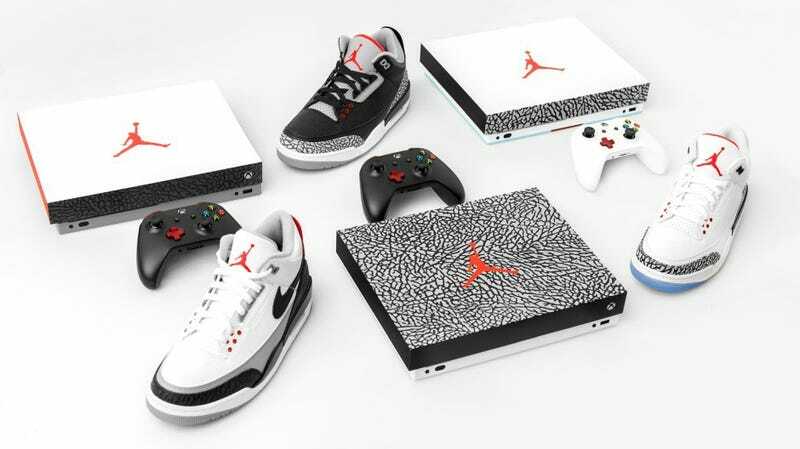 The three consoles are each based on an Air Jordan 3 colourway (“Black Cement“, “Free Throw Line“ and “Tinker Hatfield”), and each set comes with both the console and the shoes they’re based on. Nike and Microsoft did something similar last year with the Atmos x Air Max, and like...I get that competitions make these packs seem valuable, but it’d be nice to be able to actually buy something like this. H&M has a Nintendo 64 t-shirt on their site right now. Nintendo will license out their stuff no problem. But they're too cool, so you know we're not getting them. Westbrook just took over Kyrie for best PEs. His mario kart - super soaker - toad - gameboy silhouettes are some of the best I’ve ever seen. TQ Quest and mische like this. I can guarantee Jordan/Nike did not ask permission to use for the Super Soaker-inspired PE. Why don't you think there was any SS branding? I work in licensing at Hasbro (owner of NERF, SS) and 100% my team never was approached by Jordan brand about it. Yes, officially licensed deal agreement. Nintendo will get royalties and gave approval on that, agreed on royalty rates, etc. Another thing is that the PE colorway doesn't completely lead itself to the brand. Without the tag and packaging, we wouldn't call those those GameBoys. The custom packaging done by that recon lab is what really ties it closely to the IP. 100% my team never was approached by Jordan brand about it. Those game boys are fantastic but it’s getting annoying how much effort is being put in to p.e.’s. How about the same effort in pairs that we can buy. This isn’t directed at just these, for the most part the released colorways are good, this is across all sig shoes. Mamba.Max and alchemist iq like this. love this design. one of the best over the last few years. my only gripe is the midfoot arch support is bit too much. hopefully it breaks in like the Jordan 32 eventually did. the forefoot zoom is so sweet though. Totally agree. They could of dropped some sweat *** CNY CW for us. Or atleast for Asia... but nah I haven’t seen anything?! They're kind of squandering the hype. First cw came out the gate hot, but in limited fashion. They haven't followed up with anything to seize all that excitement. They’re not planning to sell the shoe. My point was if they were, they’d do it the right way. duke40 and jaynev like this. cubanref, blitzbro1, hitchisanoun and 4 others like this. Those should have been the ASW shoe it actually matches the jersey. blitzbro1, mische and hitchisanoun like this. cubanref, ivyleague23, Da Real Mars Blackmon and 5 others like this. I can actually see this pair releasing. Is it inspired by some other IP that can make it not?